Each of my daughters is more beloved and special than the others put together. And vice versa. All so true and wonderful! Lucky, lucky ladies, the 3 of you. And Ben is lucky, too! And I did have my sister around a lot when my first three kids were babies. Who taught you which was Foot A and which Foot B? Or read every kids’ book she bought you before choosing it? And so much more. I raise my glass to the clan – all sides and ages of it! And especially to Auntie Em today! Yay! Thank you, Di. This made me cry. But in a good way. I love you. Happy birthday Em. Yay for families! What a beautiful tribute to your sister. You are both fortunate to have each other! A belated happy happy to Emily. Birthdays are wonderful, and finishing major academic projects possibly even more wonderful. Di, this is such a great tribute to your big sis. It’s been an hono(u)r knowing both of you these 30-some-odd years (and Beth and Ben, too!). When we were little, I didn’t understand, but now I envy your sisterhood–it’s a special thing those of us without sisters will never fully experience, no matter how close our female friends or our brothers are. P.S. I know it’s been 31 1/2 years, but it sounds better to say 30-some-odd. Thanks for this lovely comment, Helen! It’s been an hono(u)r knowing you and your family too. And for the record, I think we’ve been pretty darn close to sisterhood some of these years, in spite of the distance and the time between summers. 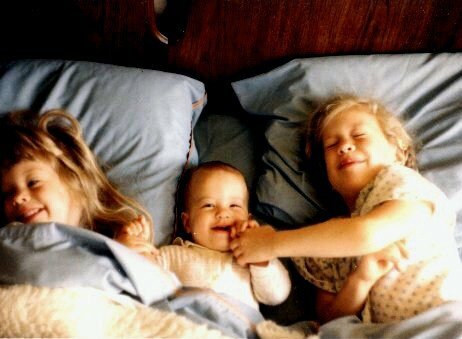 I can’t remember ever bickering – or even really disagreeing – with you (which is something I did constantly with my sisters back in the day). I just think of marathon conversations about every-which-thing. Oh, Di, I do miss our marathon conversations! Last time we saw each other I was too busy cooking and you were too busy mommying to really have that chance to sit down for a few hours. Perhaps we can find some time in 2013! I very much hope so! I miss them (and you) too. Helen, you are sister-y to me too! I loved getting to hang out with you last year at Camp, in spite of all the drama.